FireTrace | Haven Fire & Safety L.L.C. Firetrace International is the world leader in special hazard fire protection, providing both in-cabinet and machine level fire prevention and protection for high value and/or mission critical equipment as well as the new E4 Engineered Solutions for protection of large rooms. 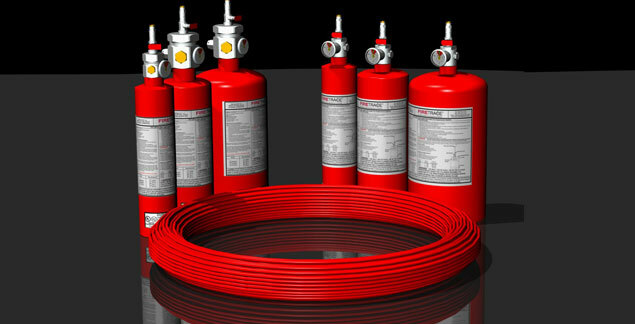 Firetrace tube systems are reliable, cost-effective, automatic fire detection and suppression systems that can be installed in virtually any “micro-environment” or small enclosed space where critical assets are located or where an increased risk of fire could be mitigated by an automatic fire suppression system. Utilising the unique, proprietary Firetrace Detection Tubing, Firetrace systems are able to be installed inside virtually any enclosure or "micro-environment" and are completely self-contained, requiring no electrical power and are easy to install and maintain. Whether you are looking to protect inside an Electrical Panel, Bus or Heavy Vehicle engine bay or even a Wind Turbine, Firetrace Systems ensure that any fire is detected and suppressed at its source, minimising damage and greatly reducing the impact of any downtime to your business. For larger risks, such as data centres, archives or processing facilities, the new E4 System with 3M Novec 1230 Fire Protection Fluid offers an enhanced fire suppression solution that outperforms other systems of its type. In developing Firetrace E4 systems, traditional conventions were thrown out, allowing a fresh look at how E4 could benefit from the unique flow characteristics of Novec 1230, which enabled unparalleled flexibility in discharge network design, reduced the amount of piping required, lowered installation costs, and meant that system networks that simply could not be achieved without the incorporation of expensive nitrogen driver systems were now possible. Firetrace International's E4 has set a new standard for total flooding systems by using low cost, low pressure hardware while delivering performance that has been typically associated with high cost, high pressure systems. Haven Fire are fully Manufacturer trained in the design, supply, installation and commissioning of all of Firetrace International's fire suppression systems and hold stock within the UAE.